Fingerprinting Express is an approved vendor for the Nevada Board of Nursing. We specialize in nursing fingerprint services, including traditional ink fingerprint cards and Livescan electronic fingerprinting. Our fingerprinting technicians are the best in the business when it comes to accurate RN, LPN, and CNA fingerprinting. We can also help with any questions you have regarding the fingerprinting and background check process as it relates to your nursing licensure/renewal application. We are the fingerprinting experts so you don’t have to be! Step 2: Create an account. If you have an open application with the Nevada State Board of Nursing, or a temporary license/Interim Permit, you must provide your first and last name, date of birth and social security number when you create an account. If you have ever had a license/certificate (including lapsed/expired and inactive) you must answer “yes” to the question “Do you have a license with the Nevada State Board of Nursing”. When you create an account, you need to make sure your name matches our system. For example, if your name has changed since you last renewed, when you create your account through the portal, you must use your previous name. Once the account is active, you can go through the process of changing your name. Step 6: Get Licensed! If you do not receive your license after 60 days from fingerprinting, verify the Nursing Board has received your results. If after 90 days, they have not received your results they will make you get fingerprinted again for an additional fee. Fingerprinting Express verifies every record we send hits the state system. We are not notified when results are sent or received. We want to make sure you don’t have to hassle with this again so keep checking the portal for updates. We recommend setting a reminder in your phone, just in case. The Nevada State Board of Nursing strongly recommends that nursing applicants submit their fingerprints electronically using Livescan transmission instead of submitting an ink fingerprint card. Livescan results are faster, less prone to error, and securely transmitted. Please note that the NSBN encourages those applying for or renewing licensure to have fingerprints taken early in the process to avoid unnecessary delays or lapses in your temporary license. Fingerprinting is a requirement for initial nursing licensures/certificates and renewals in Nevada. Nurses must undergo a fingerprinting background check for initial licensure and then every five years (or as directed by the Nevada State Board of Nursing). Stop into your local Fingerprinting Express to have your fingerprints taken. If you opt for Livescan electronic prints, they will automatically be submitted to the Nevada Department of Public Safety, and the results will be directed to the NSBN. Or bring in the fingerprint card provided by the NSBN to have your ink prints taken. If you had Livescan fingerprinting done, simply attach a copy of the receipt we provide you to the Fingerprint Submission Form found in your application and send it to the Board. If you have a fingerprint card, send it to the Board along with your Fingerprint Submission Form. Click here for detailed instructions on completing and submitting your fingerprint card or Livescan prints for the Nevada State Board of Nursing. Why deal with the aggravation, long waits, and inaccuracies that go with getting your fingerprints taken at the local police department? As Nevada’s fingerprinting experts, Fingerprinting Express has the lowest rejection rates in the industry (.002% compared to the industry average of 1%). We even have a few tricks up our sleeves for hard-to-get fingerprints! Our highly trained staff will have you in and out in minutes. 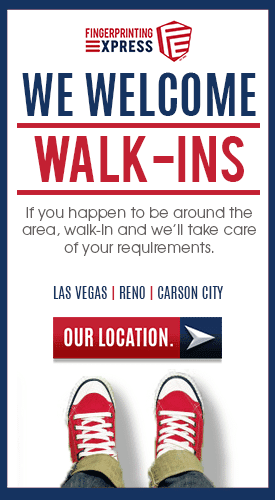 Book an online appointment or stop in as a walk-in to one of our four comfortable, secure and modern locations. Q: Can I submit out-of-state electronic prints for my Nevada nursing license application? A: No. The NSBN will only accept electronic fingerprint submissions from an approved Livescan fingerprint vendor in Nevada. Q: What if the fingerprints I submitted for my nursing license or certificate are rejected? A: This is not unheard of, especially for seasoned nurses. We guarantee our fingerprints and we have the best resolution equipment along with certified fingerprint technicians trained to use every technique to get the best possible prints the first time. However, if your fingerprints are rejected for any reason, simply print your rejection letter and bring it along with your Fingerprinting Express receipt and a valid government-issued photo I.D. and we will retake your fingerprints free of charge. Q: Does it matter what fingerprint card I use for my nursing licensure application? A: Yes. You can only use the FD-258 coded card provided by the Board. Q. Do you fingerprint for Traveling Nurses? A: Yes! We fingerprint traveling nurses for all 50 states.